Se sumergen los pies en un jacuzzi burbujeante con agua caliente y fungicida. A continuación se procede a cortar, limar y se pulir las uñas de forma delicada. Se eliminan callosidades y durezas, suavizándolas y utilizando el torno. Se tratan las uñas encarnadas y con cualquier otro problema que puedan presentar y se efectúa un peeling con una crema exfoliante compuesta de azúcares y aceite que permiten permiten la eliminación de las células muertas y deja la piel como nueva. Se aplica la crema y se da un masaje relajante. Se aplica una base protectora y edurecedora sobre las uñas y sobre ella un esmalte y se termina con un brillo protector. Luce uñas perfectas durante más de un mes y elige entre más de 200 colores. Una vez terminada nuestra pedicura se procede a esmaltar con gel semipermanente. Su fórmula es una combinación de químicos orgánicos que protegen la uña natural, dando lugar a un producto único para el estilismo de uñas. Respeta y fortalece la uña natural. Fácil de retirar, en menos de 15 minutos mediante un líquido que no daña la uña. Enriquecidos con ingredientes claves para darle a tus pies la nutrición que necesita. Puedes elegir entre nuestra gama de aromas. *Se recomienda hacerse la pedicura antes del tratamiento. Moisturizing pedicure with paraffin, the latest in hydration. With Shea butter, it is one of the best moisturizers and emollients par excellence. It nourishes the skin restoring the smoothness and elasticity. A mixture of minerals containing Epsom, dead sea and California sea salts is added to the water, which stimulate and detoxify and soften the skin. We perform an organic sugar exfoliation that absorbs the toxins by dragging and removing the dead cells will keep the skin moisturized, renewed and luminous. 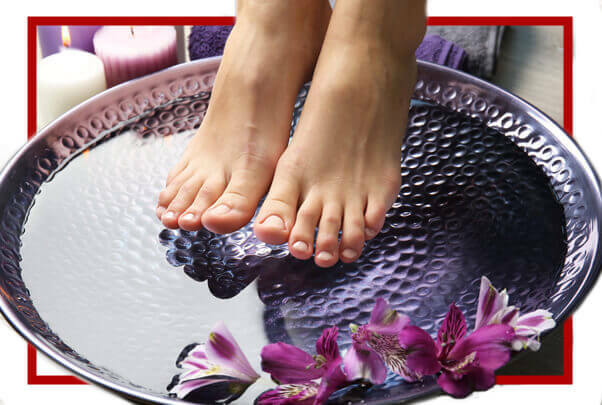 The feet are immersed in a paraffin bath of Shea butter that will provide you with the highest hydration, well-being and protection in the skin, and will make your feet feel hydrated. As a finishing touch, we apply an organic lotion with aloe vera, avocado, Shea butter and olive oil, sesame and soy that will help to nourish and retain moisture in your feet. Pedicure effective in solving the problem of toenails weaknesses. It is the perfect treatment to nourish them to the maximum and give back the strength they have lost. 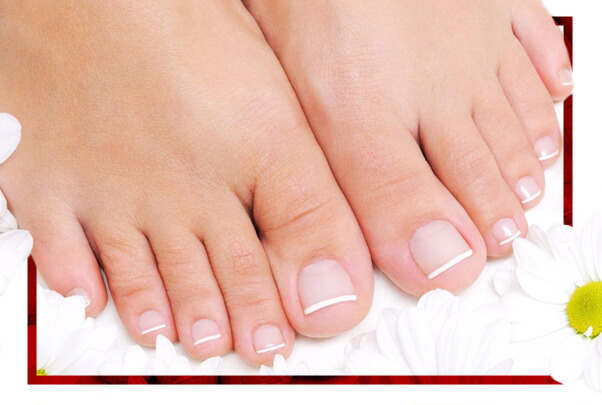 If you want the perfect pedicure you must first have healthy nails. Apply the repairing product, let it dry and cure on a lamp. We finish by cleaning the excess and applying the nail polish chosen. To give a new appearance to the nails with a colour or combination of the more than 100 nail polishes we have. Remove existing enamel, file and cut nails according to the desired shape. Then, we apply a coat of protective base with vitamins and nutrients and apply the polish chosen. We finish with a drying-shine coat that accelerates drying and protects the enamel with a high lasting gloss. Before performing the pedicure you will wear booties enriched with collagen, then we remove the tips of it and then perform the pedicure. At the end, the bottee is removed and a massage is given. Save time by hydrating your feet while getting an ideal pedicure.